After studying fencing at Heidelberg University in Germany for many years, Udon was confident that he could take on any contender. Sadly he underestimated the chop stick skills of Hank, the privileged white man who pretended to be worldly because he could use chopsticks. 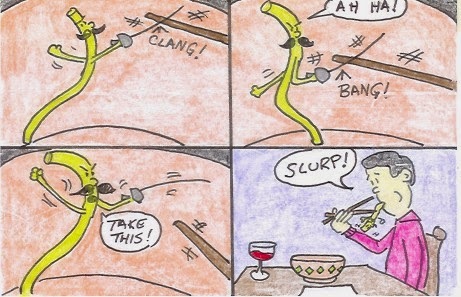 Posthumously, Udon got his revenge when Hank swallowed his sabre and required a tracheostomy performed utilizing his own chopstick.